‘By now, everyone knows about the phenomenon of Plastic Soup.’ So I am told ever more frequently nowadays. Yet, there are still a lot of people out there who have not heard of it. And even they often do not know in-depth what this phenomenon really means for our world, and for future generations. Increasingly, I educate groups about the plastic soup, even those people who are supposed to know about it: green Dutch members of parliament, the Dutch National Youth Council (section sustainability), and recently ICIS in Maastricht (International Centre for Integrated assessment and Sustainable development); and in all these groups, some 90% do not know about plastic soup’s consequences. In the most recent Dutch sustainable Top 100, yearly published by newspaper Trouw, nobody was active in fighting the plastic soup. 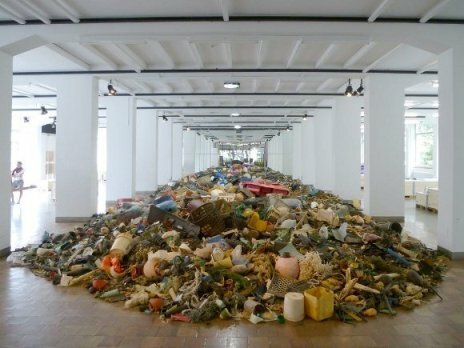 In consequence, there is still much to be done, but we will have to do that quickly because every 15 seconds our world adds as much plastic to the oceans as is shown in this picture. And this movie (in Dutch) shows impeccably how the plastic soup is produced, and what the consequences are. A few shots show Jan Andries van Franeker, of the Imares Institute, with whom I roamed through the Netherlands for three days, drawing attention the plastic soup. Organized by the Plastic Soup Foundation.